Robert Atkins has worked as a penciler, inker and colorist within the comic industry. 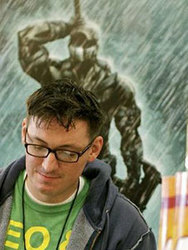 His most recent work includes the penciling chores on ABC's Castle for Marvel. Robert is most well know for his work on IDW's Snake Eyes and relaunch for GI JOE! He has also worked on Amazing Spider-man, Venom, Heroes for Hire, Ultimate Fantastic Four and The Savage She Hulk for Marvel comics. Other works include Transformers for IDW, Legion of Superheroes for DC comics and the Savage Sword of Conan for Dark Horse. He is co-creating a series titled Elders of the RuneStone with writer Quinn Johnson (KungFu Panda, TMNT). Which is scheduled for release soon!